The smoky flavour of the chorizo works really well with the mussels and the wine in this quick and easy to make dish. Be sure to serve it up with some freshly baked crusty farmhouse bread to soak up all the rich juices left in the bowl. Wash the mussels under plenty of cold, running water. Get rid of any open ones that won’t close when tapped. Pull out the beards that stick out from the closed shells (these are strands that look a bit like sea weed). Give the mussels another rinse to remove grit or pieces of shell. Fry the Yorkshire Chorizo in some oil to release the flavour and the colour in a pan that will easily hold all the mussels. Add the garlic, shallots and butter with the bouquet garni, and gently fry to soften the shallots. 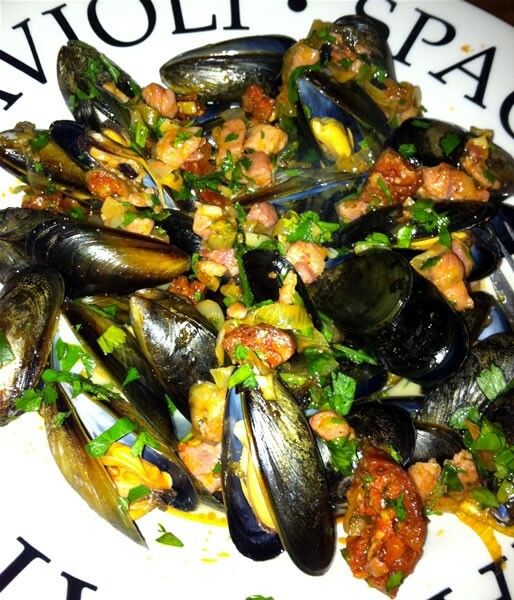 Add the mussels and wine, turn up the heat, then cover and steam them open in their own juices for 3-4 minutes. Give the pan a good shake every now and then. Remove the bouquet garni, add the chopped parsley and remove from the heat. Spoon into large warmed bowls and serve with lots of crusty bread.